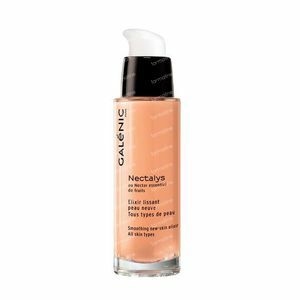 Galénic Nectalys Smoothing New-Skin Elixir 30 ml order online. The delightfully fresh Galénic Smoothing New-skin Elixir smoothes and refines the skin texture with a hint of sparkle and indulgence. With two times more active ingredients than the rest of the range, it delivers a power-packed energy boost for a guaranteed peachy skin finish. - Glycolic acid helps to smoothe, brighten and renew the skin for a non stop dosage of radiance from deep within. A wrinkle smoothing serum with a natural vitamin C complex to help boost skin's radiance. Suitable for all skintypes. - Apply in the morning and/or at night to face and neck before applying your daily cream. - Can be used daily or as a three-week treatment. WATER (AQUA). CYCLOMETHICONE. PEG-8. PENTAERYTHRITYL. TETRACAPRYLATE/TETRACAPRATE. POLYACRYLATE-13. MALTODEXTRIN. ACRYLATES/C10-30 ALKYL ACRYLATE CROSSPOLYMER. CHLORPHENESIN. CITRUS NOBILIS (MANDARIN ORANGE) FRUIT JUICE (CITRUS NOBILIS FRUIT JUICE). DIMETHICONE CROSSPOLYMER. DIPHENYL DIMETHICONE. FICUS CARICA (FIG) FRUIT EXTRACT (FICUS CARICA FRUIT EXTRACT). FLAVOR (AROMA). FRAGRANCE (PARFUM). GERANIOL. GLYCOLIC ACID. HEXYL CINNAMAL. LECITHIN. LIMONENE. LINALOOL. ORYZA SATIVA (RICE) POWDER (ORYZA SATIVA POWDER). PHENOXYETHANOL. POLYISOBUTENE. POLYSORBATE 20. PRUNUS PERSICA (PEACH) JUICE (PRUNUS PERSICA JUICE). RED 40 (CI 16035). SORBITAN ISOSTEARATE. TRIETHANOLAMINE. YELLOW 6 (CI 15985). This product is smooth and nice to apply. It does not irritate the eyes hence it can be used all around the face and neck. It is certainly a good moisturizer, but I have used it for a couple of weeks now and cannot really see any improvement yet of lines.